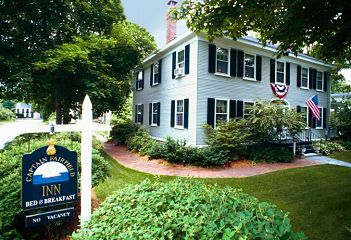 The Captain Fairfield Inn welcomes you to a gracious and elegant Federal mansion, located in the heart of Kennebunkport's picturesque historic district. Surrounded by towering trees and beautiful gardens, the Inn overlooks the Town Green with glimpses of the lively Kennebunkport harbor. Bedrooms are spacious, beautifully and individually decorated with antique and period furniture, have comfortable sitting areas, and private baths, four-poster and canopied beds, fireplaces...all creating an atmosphere of tranquility, romance and peace. Innkeepers Leigh and Rob begin each day with one of their scrumptious four-course gourmet breakfasts, including such delights as home-baked muffins and breads, Maine blueberry crepes, pumpkin pancakes, skillet fritattas, omelet Fairfield or Eggs Benedict. The Bed and Breakfast is ideal for those who enjoy a location within walking distance to the ocean, restaurants, shops, and art galleries; yet seek a peaceful, quiet, and romantic retreat.